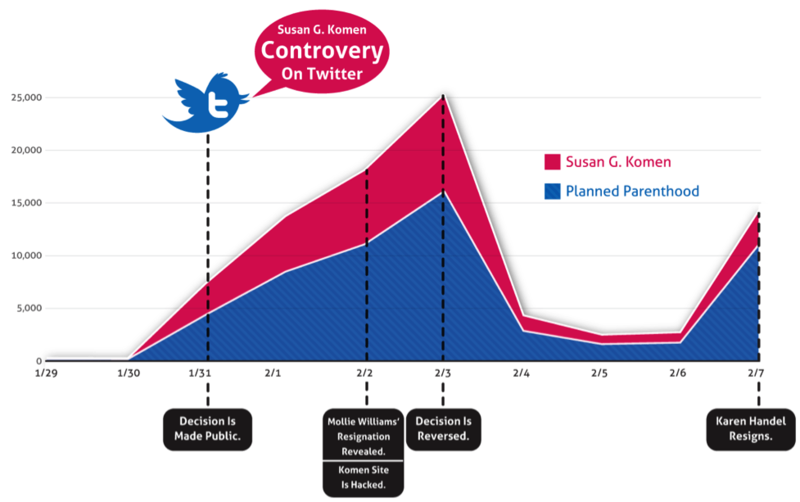 In early 2012, when The Susan G. Komen Foundation withdrew funding for breast cancer screening from Planned Parenthood, it caused a tidal wave of anger and sadness on Social Media. The Susan G Komen Foundation announced that they’d be withdrawing all breast cancer screening funding from Planned Parenthood because they also provided abortions. The backlash was swift and loud, particularly on social media. Donations to Planned Parenthood increased dramatically and overnight. After going silent for 2 days, SGKF reversed their decision and announces that CEO Nancy Brinker (sister to Susan G Komen) would step down. Nancy Brinker, the founder of SGK, was STILL CEO, although the organization stated that it was searching for a replacement. SGKF announced in early June that it would cancel half of its 3 day races in 2014 and its signature walk in 6 cities due to a bad economy and lack of donations; registrations were down considerably. The Foundation has virtually ceased its lobbying efforts, after spending more than $1 million in 2012. Nancy Brinker and the organization took a tremendous amount of heat for her $600,000+ salary, and was being compared to charitable organization’s 10 times the size of SGKF, the Red Cross, whose CEO makes $500,000. In this day, any PR Crisis an organization faces will be amplified on Social Media; it is not only the vehicle for building momentum for causes, it is THE communication method of choice for so many. A social savvy group with an issue or vendetta can cobble together an online petition, a Facebook and Twitter presence, and boom – they’re off to the races with whatever target they’ve got in their cross-hairs frantically trying to catch up and counter punch. The uprising against SGKF was widely covered in both mainstream and online news in 2012. Banyanbranch.com covered the flurry of social media activity surrounding the crisis in a post back in February of that year. Other stories began to bubble up about other distasteful moves by SGK, and gave a boost to the public profile of one of SGK’s harshest critics, Barbara Brenner. Donations to SGK dwindled; Planned Parenthood experienced a tremendous increase in donations. During the crisis, and certainly with hindsight, it is clear that Planned Parenthood misjudged its supporters and in particular, their distaste for politics interfering with the mission of stomping out breast cancer. SGK was caught off guard, and mishandled the situation for weeks. After the enormous public outcry the foundation reversed its decision, and refunded Planned Parenthood. Eventually, the social media outcry died down, and the mob turned its sights to other, fresher crises, but the resonance of that uproar is still impacting Susan G and its efforts to raise money. Where Does the Susan G Komen Foundation Stand Now? OpenSecrets.org reported that SGKF has drastically reduced it lobbying efforts in a blog from May 10th of this year. In the same month, NonProfitQuarterly.org also reported that the foundation’s lobbying spending was down drastically from the $710,000 it spent in 2011. SKG appeared to be slow in its comprehension of the impact of its decision to stop funding for Planned Parenthood, and it was equally slow in carrying out damage repair to appease its detractors.Nancy Brinker, the sister of Susan Komen who founded the organization to honor her memory, was – at first – resistant to stepping down amid the controversy. Eventually, when it became clear the backlash was going to have a longer term effect, Brinker agreed to step aside and begin the search for a new CEO. That search took an exceedingly long time, lingering well into 2013 and turning the microscope onto Brinker’s salary and providing the detractors with more fodder for their campaign. On June 17th, SGK named Judith Salerno to replace Brinker, who would be moving to a new position, Founder and Chair of Global Strategy. The new CEO is presently serving as the Executive Director and COO of the Institute of Medicine, and is slated to replace Nancy Brinker on September 9th. The Opinion and other blogs have written that Brinker was resistant to giving up her CEO role, and that many within the organization are concerned that she will still try to call the shots although she will be reporting to Salerno. Only time will tell if Brinker does indeed still see herself as the controller of the foundation, but one can only surmise that her continued presence at the foundation will make it harder to repair the image of the Susan G Komen Foundation. Salerno is approaching her new position with optimism, telling the Dallas News that she thinks the foundation has ‘turned the corner,’ and who can blame her? For most of its 31 years SGK was seen as a powerful force for good in the fight against breast cancer. SGK notes that Salerno will also be earning considerably less than her predecessor, and that Brinkman will also experience a serious reduction in salary as she moves to her new position. Will the Susan G. Komen Foundation recover? We’ve covered numerous campaigns, outlining both the good and bad effects that social media can have on an organization. Many times we note, or our readers loudly remind us, these PR dust ups are much ado about nothing. The story we cover may be the story of the week, only to be replaced by next week’s; the company or group that was lit up by tweets and posts one week is back to business as normal the next, or not long after. Not so for Susan G. Komen, and in many ways, this is one of saddest of stories we’ve told. Yes, the foundation brought a public backlash upon themselves by not understanding the outlook of so many when it comes to Planned Parenthood. I think it’s clear that they had no idea how strongly it would impact their once great and well respected cause. By all accounts, they fumbled in their reaction, and by the time SGK reversed its decision the public outcry had grown into a movement on its own. Taking over a year to reorganize at the top, it appeared as if the foundation had no understanding of how to move forward. One can only guess at the power struggle going on as the board tried to move Brinker out of the top spot, but the delay in doing so continued the downward spiral for the foundation. Yet SGK is not finished; as we’ve noted in many of our Social Justice posts, large organizations can often outlast the negative story, even if its self created. In this instance, just staying around and continuing to do ‘business as usual,’ hasn’t been enough. The changing of CEOs may very well be the first real step in ‘turning the corner.’ The Susan G. Komen Foundation has a long way to go to regain donations and supporters. Perhaps their new leader and the PR department will understand how to use the power of Social Media to positively impact their organization and its fortunes. I think having Brinker leave (but not leave, just take a different seat in the boardroom) wasn’t a very effective plan. I think they would have had better success with reputation repair if they skipped that empty gesture and went straight for a discussion of how they learned more about their core base of supporters than they had known before; that Brinker herself had a renewed sense of duty toward women and their complete health. That kind of gesture, apology, action and return of support to their community would have, in my opinion captured more flies. I don’t think it matters who is the CEO – that decision wasn’t singularly executive. I think it matters who the foundation is here to serve and how they carry out that service. I think replacing the CEO is scapegoating and pins the decision to remove support from PP, and the opposition to restoring support to PP squarely upon one person’e shoulders, when in reality it couldn’t have happened that way. OneJillian I’m with you Jilian; I think what it clearly states is that no one at the helm knows HOW to get out of the deep hole the foundation has dug itself. Firstly, they didn’t understand that entering the political arena was unwise, and secondly, they didn’t handle it well during the crisis. NOW it appears that they are still rudderless when it comes to PR. Someone needs to have some clear and honest conversations with their board and lay it on the line. My guess is that if they had brought in an outside PR team they would’ve received some of that much needed straight talk. I hope Salerno can give it to them. 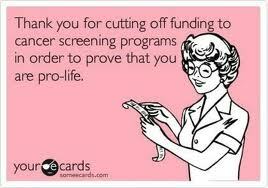 I hate what Komen did but I hate to hear that their rallies for life are down. I am not sure how much monetary good those did but I know that family members of cancer patients and cancer patients themselves got a lot of comfort from those gatherings. It’s too bad we have to throw the baby out with the bathwater. margieclayman Yes, and although SGK brought this on themselves, it DOES hurt. They became THE face for Breast Cancer awareness, and they have not been replaced. I hope this new CEO can get them on track and sort it out. Remember, it took SKG years to reach their plateau; the recent backlash and desire by previous supporters to find alternatives will allow these other charities and organizations to begin reaching their own potential. Danny Brown AmyMccTobin margieclayman Yes, SGK has been at it 31 years. I know that the American Cancer Society and others have gained a lot since the drop off. I stopped supporting SGK when they began going after ANYONE using “for the cure” in any way (I understand the need to protect a brand, but I think their efforts went way over the line). I completely agree with your assessment – presented far more articulately that I could ever dream – they made a critical error and fumbled over and over and OVER in their response. And the Planned Parenthood piece was the third in a series of mistakes, to my mind. First was the lawsuits, second was severe reduction in funding to numerous reputable cancer research programs using stem cells, and third was cutting funding for Planned Parenthood. The good news is at there are many excellent nonprofits and programs supporting cancer research, support programs and services out there that can benefit from our support, whether local, regional, national or international. mickeygomez I guess the lesson for any major organization should be this: with American politics so polarized, stepping into the political arena for ANY cause is dangerous. What amazes me is that SGK did not have a firm grip on what the majority of it’s supporters thought about women’s issues. Monitoring can help find these cobbled together attacks across social channels, blogs and review sites – but the brand still has to tread carefully with how they respond…and assume they are going to get sullied regardless. Sometimes it is Social Justice…sometimes it is “Social Witch Hunt because I didn’t have anything better to do with my time this week”. dbvickery I don’t think you can call SGK a witch hunt situation; they stepped into the political arena over a very hot button issue and got burned. However, it is also clear that support for the charity had waned over other issues prior to this – see Mickey’s comment below, and, the fact that their executives were paid SO very much more than the standard for other charities. It is rare that ONE action tears your organization apart, but it is not uncommon for repeated dings to your reputation to eventually catch up to you. AmyMccTobin Oh, I wasn’t equating the SGK situation to a Witch Hunt…a better example would be the dongle incident. Same can go for the Taco Bell licking incident or the Domino’s video. Don’t crush a brand because of a few bad apples.